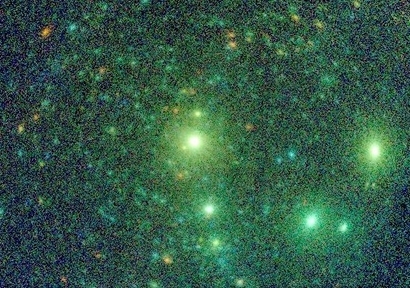 XMM-Newton observation of the core of the very massive cluster Cyg OB2 located in the constellation of Cygnus, 4700 light years from Earth. The cluster contains massive O-type stars that shine brightly in X-rays. Cyg OB2 #9 is seen as the bright star just below the central star, and in 2008 was determined to be a binary system. ESA's XMM-Newton and NASA's Swift space telescopes have now found evidence for the winds of these hot, massive stars colliding at the closest points of their orbits, resulting in a four-fold increase in X-ray emission. Hundreds of lower mass stars also fill the field of view, which spans nearly 22 × 16 arcminutes.